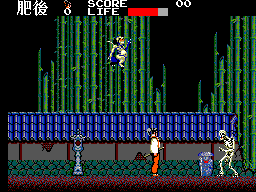 I often find myself calling this game the samurai version of the classic game, Shinobi. Maybe not as well known this game does have that classic 'land of the rising sun' feel. This game did for the samurai as what Shinobi did for ninjas. 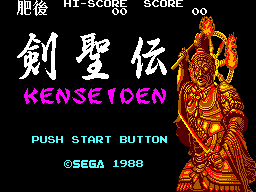 Kenseiden is quite a challenge to complete. Not just in skill, but sitting down and getting through all sixteen rounds! You start out with some simple attacked, and the levels seems to move from one to another. At first that is, because this game also has some cool features. After you clear round two the country map will show two Japanese characters (each a name of a province). There is a total of sixteen provinces and when you clear one you may move to a bordering province. The second is when you fight and beat a warlock you obtain a scroll that lets you do even more cool tricks! Complete with spots to train your skills. It does take a good sit down though to get though. Walking back and forth across the map trying to collect all the scrolls so fighting the final boss isn't such a pain. Sort of game that take some real dedication and a whole afternoon. For having a lot of levels this game sure has some good textures! Lots of different enemies all flying about with a great use of pixel colour! Your character isn't some brown blob with a white line for a sword. He's a fully dressed samurai in robes. With his sword at his side and his long hair tied back. You could really tell the designers wanted to make it feel like a 16th Century Japanese tail of magic. One of those games that really made the SMS graphics card sing! Though in some places sounding repetitive the music and sounds in the game are not all bad. For an early consul game they did a good job giving it an oriental feel. Changing the score here and there to keep the background from getting to boring. Even the country map scene has a small little song it plays that sort of creepy. Nothing super over the top as I'm sure they spent a lot of space on the graphics. Until you get some scrolls your guy doesn't do to much. The game does however give you a range of movement that gets better as you progress. The trick is knowing what order to play each round in so your strength increases as the levels get harder. Sometimes you do get frustrated when enemies hit you causing you to stumble. Like a Samurai it take some skill to complete the game and learn all the secrets of Hayato's family scrolls! If you want a challenge, or just like anything Samurai this game will keep you going. The only thing that might give it draw back is that Kenseiden is rather long. With no save function you often have to start from the beginning. Still, the game is challenging and nice to look at. Maybe with a lot of practice you might destroy the army of Yonensai! This game is quite a title that should have gotten more credit. Maybe it was the whole sixteen rounds with no password, but then so was Wonder boy. 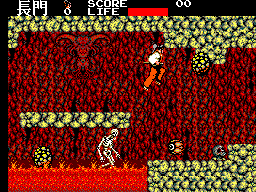 Still if you want a good counter part of Shinobi then you might want to try this game! Filled with classic demons and evil warlocks this is a must have for anyone looking for a good Sega game!